We have a range of mobile shredding units that destroy material at your facility to cater for our on site shredding service.The trucks are fitted with high spec shredders that produce a high quality shred with speed and efficiency. All material is then transported back to our facility to be ejected and baled. We export all shredded paper for recycling directly and therefore can control the entire process from shredding to recycling. All units are fitted with CCTV Systems covering a process overview and are on a 7 day record cycle to an internal DVR System. Recordings are available on request and can be used as verification of the service provided. In addition to this all vehicles are fitted with GPS Tracking. Click here to see all our security features. 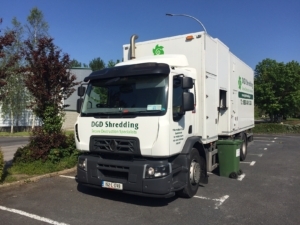 Following the on site shredding of the material, a service docket is issued detailing the specifics of the service. It is signed by both the operator and an authorised customer representative. On return to base, a copy of the docket is presented to the office and both a destruction certificate and invoice are raised. These are then posted out to the customer along with a duplicate of the service docket which can be used for verification.